As a business strategist, one of the first things I look at when someone is struggling in their business is whether or not they are clear on who they are serving, their mission, their core values, and where they should be focusing their efforts. More often than not, people exclaim with glee that they are clear on all of those things and have all of the necessary pieces in place. And more often than not, they really don’t have those things and it is a hard pill to swallow. When we go into business, we often have a beautiful visual of how it’s going to be and we go into it wanting to help all of the people. Health Coaches, for instance, often go into the field wanting to help women lose weight. Way too broad and snooze worthy to boot. It’s not their fault. It’s just our strong desire to make our mark and impact on the world has us reluctant to narrow things down. We feel like we are going to miss out on clients and riches if we dig any deeper. The fact of the matter is, if you don’t narrow things down, you won’t be talking to anyone in particular and crickets are going to serenade you on the regular. 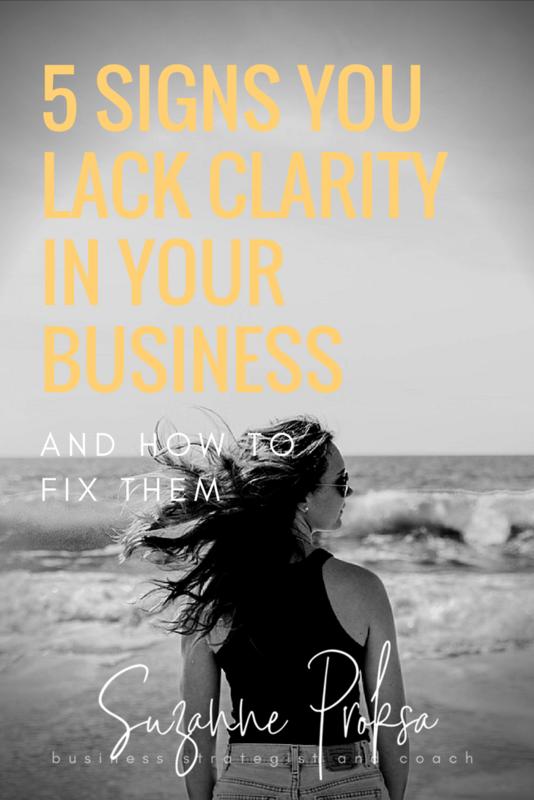 So let’s dive into the signs of a lack of clarity and how to start trudging down the path of fixing them. 1. Creating content is a painful experience. This painfully crippling occurrence is not uncommon. You sit there staring at a blank computer screen and you’ve got nothing. Nada. This often comes from not truly knowing who you are talking to, what your focus (or your jam) is, and what your mission is. I can tell you from experience that once you are hellbent on a mission and you know who your peeps are and what information they crave, content creation becomes a dream rather than something that requires two pots of coffee and 5 days of mindset work. 2. You don’t get out there as much as you should. Sometimes this phenomenon is due to fear or lack of confidence. But often times, it is because people don’t know what to talk about. And once again, that comes down to a lack of clarity of who they are serving and what their people are feening for. Combine this with having no idea what your brand is or stands for and you’ve got a double whammy. 3. It is painfully difficult to get followers on social media. You know those mantras about money being easy to make? Well they are true. There should also be a mantra about how ridiculously easy it is to get followers on social media. Is technique important? Oh sure. But…. If you don’t know your brand, your purpose, your flame, and what the people who need you in your life are looking for, it’s going to be a battle for you. Show them something like worthy and they will come! When you are clear on who you are, who you are trying to reach, and what you provide, you turn into a follower magnet. I didn’t get up to an 11,000 social media reach with hope and tequila. 4. Your Facebook group is a snore zone. If your group description is laser focused and clear on what people can get there and you are providing valuable education and engagement activities/posts, it’s hard to take a nappy in a group. But if you are providing a group simply to a demographic with no real focus, the struggle is going to be real. You group should be an extension of your carefully created brand and offerings. If you’ve done the brand work, the purpose and content will be crystal clear and invite the exact people who should be hanging with you into your group. 5. When you go to create an offer, your brain farts big time. This is a classic sign of lack of clarity. Once you start focusing on your strengths, your jam (aka flame), the exact problems your audience needs solved, and using your brand to plan your offerings, putting together an offer actually becomes fun and effortless because you know exactly what you are trying to accomplish and what people will swoon over. So what do you need in order to get to this blissful place of clarity? 1. A crystal clear idea of who you are serving and what you are providing. Saying you help women with weight loss is not good enough. It’s actually snooze worthy. Nobody is going to buy from you if that’s all you’re telling them about your services. Exactly who are these women and what makes them tick right down to their daily life and thought processes? What brand new concept can you introduce that nobody else is doing? You need to stand out! 2. A brand identity that people can count on. Ask yourself: Who are you really? What makes you different? What are your core values? Your mission? Do you have a vision? What can people consistently expect from you? Being fake, hiding your true self, and not having a clear brand can put water on your fire faster than a brand new fire station tanker. 3. An unrelenting propensity to use your strengths and the things that light you up in your business – every single day. Focusing on your strengths and what lights you up shows in your business. The excitement ignites that good old law of attraction. My following grows by leaps and bounds because I am now focusing on what I rock the house at (and of course my goofy personality!). Have you tried to do this alone or need some help? Until next time, come on over and join my Facebook group and mingle with some of the most amazing action taking entrepreneurs around! Join us at http://fempreneurs.biz. The SuzCrew is my FREE membership that includes a resource hub full of freebies to help you in your business and my witty insights to make you giggle while you rockstar your biz. Hop in at https://suzanneproksa.com/suzcrew ! Are you already feening to work with me? Fabulous! Head over to https://www.suzanneproksa.com/coaching and let’s get started. “Follow your dreams. They're there for a reason.” -Suzanne Proksa ⠀ ⠀ When we have big dreams, they’re there for a reason. ⠀ ⠀ The Universe is showing us all that’s possible and clearing the path for us to take over and make that dream reality. ⠀ ⠀ What are your big dreams? I would love to hear in the comments!